The REALTORS® Association of Hamilton-Burlington (RAHB) has revised the 2018 year-end market data and reports. Inconsistencies were found within the 2017 data related to listings posted on multiple MLS® systems. These “double listings” resulted in the sales and listings figures being higher than what actually took place in 2017. In August of 2017 RAHB and the Ontario Regional Technology & Information Systems Inc. (ORTIS) entered into a data sharing agreement, whereby a REALTOR® would be able to view a property on both MLS® systems without having to list it on both. Prior to the RAHB-ORTIS data sharing agreement that was initiated in August 2017, some REALTORS® listed on both the RAHB and ORTIS MLS® systems to ensure their listings received maximum reach to REALTORS® and potential buyers. This also resulted in the potential double counting of listings and sales in those regions affected. Until September of 2018, RAHB pulled data strictly from the RAHB MLS® system to compile market reports and so those reports did not include any of the double listings. Beginning in September of 2018 RAHB began using data provided by the Canadian Real Estate Association (CREA), which allowed for the combination of data with surrounding boards in order to provide a more accurate picture of listings and sales activity on a geographic basis within the RAHB market area. The combination of RAHB and ORTIS data led to the potential for double counting of sales and listings in time periods prior to the implementation of the data sharing agreement. As a result, the sales and listings figures for 2017 within the 2018 year-end market report were higher than what actually took place during the time. As soon as this issue was brought to RAHB’s attention, RAHB worked with CREA to correct the data. Data has been corrected to eliminate double listings, while still providing an accurate picture of sales activity on a comparable geographic basis. This issue primarily affected the Burlington market area, with lesser impacts on the other communities within the RAHB market area. With the revised 2018 year-data, RAHB reported 11,584 sales of all properties located within the RAHB market area were processed through the Multiple Listing Service® (MLS®) System in 2018. This is 13.7 per cent fewer sales than in 2017. RAHB had previously reported a drop of 17.5 per cent, based on inflated 2017 data due to double listings. The total dollar volume of sales continued to trend down from the previous year, and is more in line with the volume of 2015. Previously reported was a one per cent decrease in the average sale price for all properties for 2018; however, corrected data shows a 0.23 per cent increase in average price – $563,202. In the residential market, listings were down 5.9 percent compared to 2017 and sales were down 13.7 per cent. Previously, RAHB reported a drop in residential listings of 9.8 per cent and drop in sales of 17.5 per cent. When broken out into the four main RAHB market areas, Hamilton experienced a decrease in listings of 7.3 per cent (not 9.3 per cent) and a decrease in sales by 15.4 per cent (not 17.5 per cent); Haldimand welcomed an increase in listings of 15 per cent (not 14 per cent), while sales remained essentially the same; and Niagara North saw increases in both listings and sales by 26 per cent (same) and 6.2 per cent (not 5 per cent), respectively. Burlington was most affected by the double listing issue, and saw a decrease in listings of 2.4 per cent (not 12.7 per cent) and a decrease in sales of 7.7 per cent (not 17.4 per cent). The double listings issue did not affect the trends RAHB previously reported based on the individual communities within the RAHB market. The RAHB market went from a strong, prolonged seller’s market to a balanced market where buyers had more time to view and compare properties before putting in an offer to purchase. In the overall RAHB residential market, the average price was up 0.1 per cent and the median price increased by 1.2 per cent. We previously reported a drop in average price of 1.5 per cent over the previous year, while the reported median price was essentially the same. Over the past decade the average price of a residential property within the RAHB market has increased by just over 100 per cent, which is consistent with the previous report. 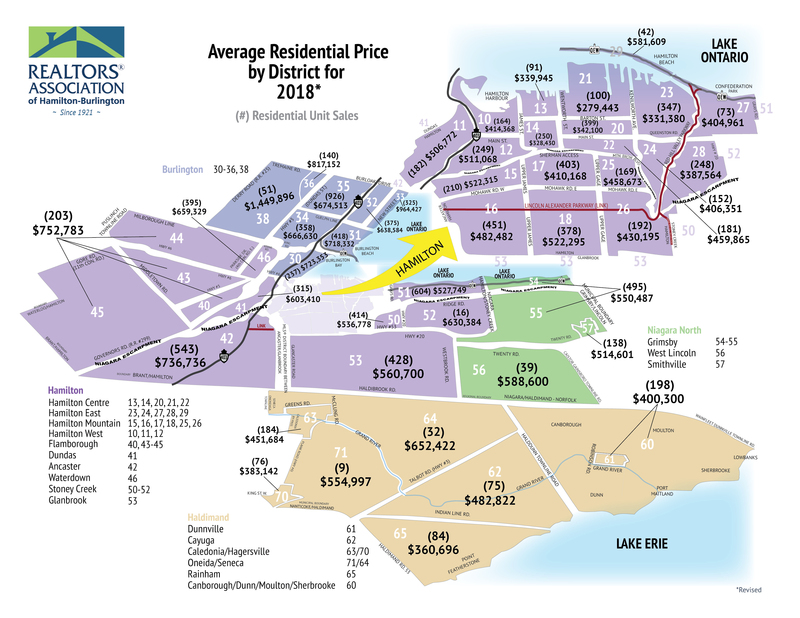 Hamilton and Haldimand saw increases in the average price, while Burlington and Niagara North experienced decreases – which is the same trend as was previously reported. With respect to property style, the biggest gains in terms of average price and new listings within the four main RAHB market areas were apartment-style properties. Detached and townhome average prices were up in Hamilton and Haldimand; however down within the other two market areas. 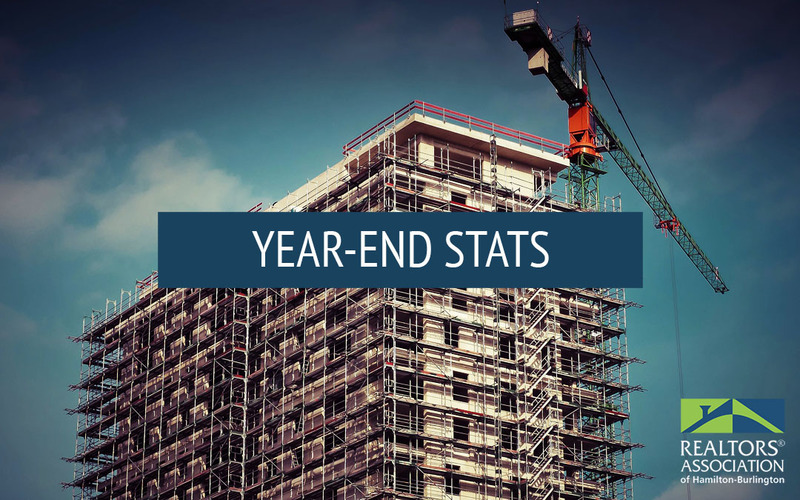 These trends are consistent with the previous year-end market report. Average days on market increased overall within the four areas of the RAHB market, and when broken down by property type, only apartment-style in Haldimand saw a decrease. This is the same trend as was reported previously. Specific neighbourhoods within the overall RAHB market area see results that often differ from the average of the entire RAHB market area. Because neighbourhoods vary, determining the right price and conditions when buying or selling a property can be challenging. RAHB REALTORS® have the local experience, knowledge and tools to help buyers and sellers make those big decisions. *Average sale price can be useful in establishing long-term trends, but should not be used as an indicator that specific properties have increased or decreased in value. Talk to your local RAHB REALTOR®.